It’s not a profound insight to say that we bring our own experiences, prejudices, and preconceptions to all of our experiences. This includes the music we hear, and the art we view. When I am creating an image, I usually have something in mind that I want to communicate. A scene may catch my eye that has an interesting juxtaposition or contrast, and it inspires me to photograph and edit in a way that gives the viewer an opportunity to see and feel what I did when taking it. As much as I like to let my photographs speak for themselves, I use these blog pages to explain my motivations and intentions for my work. But it ultimately it doesn’t matter what I was trying to do. All that matters is what the viewer sees and interprets. This image, Divided Nature, is one that can be interpreted in various ways. 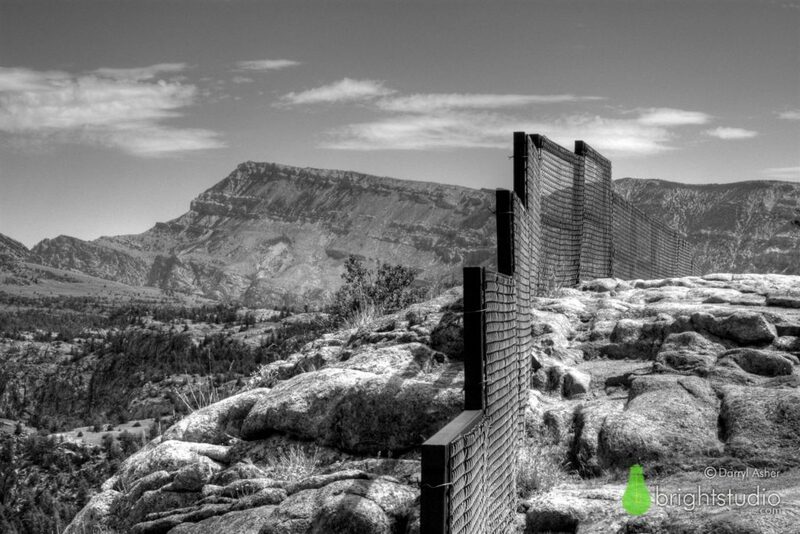 When I shot it, I was taken by the idea of this rather substantial fence that is seemingly in the middle of very rugged wilderness. It’s too substantial to be a mere property divider or livestock fence. It doesn’t seem quite big enough to be a border wall, although lately a couple people have wondered if it was a statement piece about the politics of a border wall between the U.S. and Mexico. It’s not, but those questions show how perceptions change depending on context. I’ll get to the location and purpose of the fence in minute, but what struck me about this scene was that, devoid of context, it seems like this fence is really out of place. Despite how substantial it looks, we know it’s only temporary compared to the rock formation it’s on and the wilderness it’s surrounded by. Nature always wins. I usually give my photographs pretty mundane, explanatory titles. I just usually don’t care what an image is called, but I need some way to refer to them. Once is a while, I choose a title more carefully. Such is the case here. Divided Nature is a slight play on words. Obviously, it looks like a fence is futilely trying to divide nature. But I chose Nature over Wilderness or some other word to allude to the fact that it seems to be within our nature to try to divide things, even when the result may be futile. Now, to remove the mystery of this location, and the true purpose of this fence. It’s located in Wyoming on or near Chief Joseph Highway. (I forget the actual location.) To the left of the fence is a drop-off of several hundred feet to a creek or river. To the right is a common highway rest area. The fence is to prevent people from falling to their deaths! This image is an example of how photography can “lie” simply by where you point the camera, and what you include or exclude from the frame. It’s also a good example of how perceptions are changed by context. Standing there, with highway traffic passing by, and cars parked at the rest stop, the mundane purpose of the fence is obvious. Stripped of context and isolated, then printed in monochrome, the image takes on some mystery.